Photo credit: Karl Fjellstrom/Far East BRT, Creative Commons Attribution License. 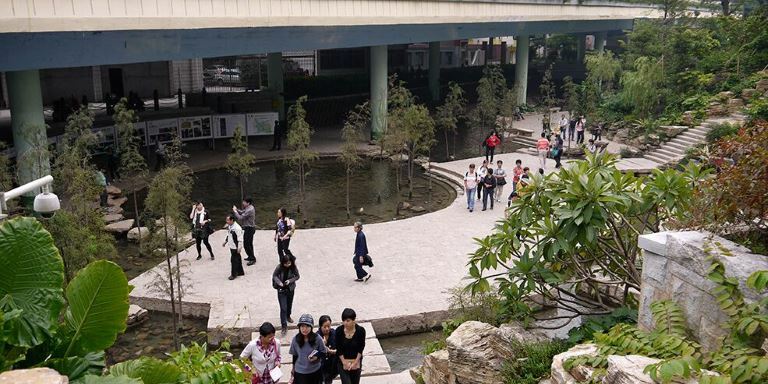 Guangzhou's Donghaochong Greenway is one of the best examples in the People's Republic of China for improving public space and mobility in a highly populated city. The Donghaochong Greenway in Guangzhou is a model for creating green spaces for recreation and increased mobility in a highly congested city. It features a landscaped corridor with winding walkways and bicycle paths, and a restored stream under an elevated highway. Opened in 2010, Donghaochong Greenway is part of an ambitious project to develop high-quality green spaces throughout Guangzhou, the third largest city in the People's Republic of China (PRC). By 2013, the municipal government had developed over 3,000 kilometers (km) of greenways. The project has helped improve living conditions for residents and raised land values in the surrounding areas. In December 2008, Guangzhou began cleaning up and restoring waterways in Yuexiu District, its oldest downtown area. These include streams and rivers that used to supply water to the city and later became sewage canals. Some have been covered over by road infrastructure. In preparation for Guangzhou's hosting of the Asian Games in November 2010, the government decided to put the cleanup of Donghaochong Canal on the fast track. The canal also became part of an urban improvement project to create greenways, which were designed to promote nonmotorized travel (e.g. walking, cycling) and improve mobility as well as reduce fuel use and pollution. Donghaochong Canal has existed since the Song Dynasty. It was used in urban defense and as a transport corridor, sewer, and stormwater spillway. The stream flows into the Pearl River and it is the only major north-south channel in the city that has not been covered. An elevated expressway stands over it. The cleanup of Donghaochong Canal was part of an urban improvement project to create greenways. Photo credit: Lloyd Wright/ADB. Worsening traffic congestion and pollution are among the challenges faced by rapidly growing cities. Photo credit: Deng Jia/ADB. Rapid urban development and population growth were taking their toll on Guangzhou and its residents. The city could not solve traffic congestion problems and the worsening pollution by merely building more infrastructure. There was a need to improve the quality of life in the city. Donghaochong Canal was heavily polluted. It was an open sewer, but this did not stop people from settling along its banks or from putting up buildings. Water in the canal sometimes overflowed, spilling sewage into nearby residential and commercial areas. Starting in 2009, over 7 hectares of land along the Donghaochong Canal were cleared and turned into a greenway. Nearly a thousand families and about 48,000 square meters of commercial buildings had to be relocated. Most of the greenway is located along the canal except for its northern section, which passes through a densely populated area. The Donghaochong Greenway was just one of the greenways that Guangzhou developed to provide new walkways and bicycle paths in the city. These continuous landscaped corridors were also connected to the public transportation system. This made it easier to just walk or ride a bicycle and then transfer to a bus or the metro for longer trips instead of using a car. Guangzhou built safe and attractive pedestrian and bicycle paths to promote nonmotorized transport in the city. Photo credit: Karl Fjellstrom/Far East BRT, Creative Commons Attribution License. The entire canal was dredged and cleaned. The first phase of development was completed in June 2010. The city built 10 bridges across the canal, 5.4 km of walkways, 1.3 km of bike paths, and 3.2 km of roads. It also opened the Donghaochong Canal Museum, which provides information on the canal and its history. Donghaochong canal before the greenway; Photo credit: Karl Fjellstrom/Far East BRT, Creative Commons Attribution License. After the restoration of the canal; Photo credit: Lloyd Wright/ADB. Donghaochong Greenway; Photo credit: Karl Fjellstrom/Far East BRT, Creative Commons Attribution License. The Donghaochong Greenway was not directly coordinated with the Guangzhou Bus Rapid Transit (BRT) project. Yet, they complement each other. Both provide dedicated spaces for walking and cycling, which help improve mobility in the highly congested city, reduce the use of cars, and lessen pollution. They also connect to the public bike-rental network. Together, these initiatives have enhanced livability in Guangzhou and the city's image. Guangzhou's greenways project created public spaces for recreation and nonmotorized transport as well as environmental conservation. It has made neighborhoods in the area more attractive. Land values and commercial development have increased. The greenways have also become a tourist attraction. At the same time, the project has helped improve land use and urban development in the city. It has contributed in making Guangzhou a showcase for sustainable development. Guangzhou's greenways project has made the area a tourist attraction. Photo credit: Lloyd Wright/ADB. There were houses and commercial buildings along the Donghaochong Canal that needed to be relocated. Local authorities consulted and worked closely with the local community to ensure the smooth implementation of the project. H. Suzuki, R. Cervero, and K. Luchi. 2013. Transforming Cities with Transit: Transit and Land-Use Integration for Sustainable Urban Development. Washington D.C.: World Bank. ITDP. 2012. Best Practices in Urban Development in the Pearl River Delta. Guangzhou. ITDP. 2013. ADB-CAF South-South Cooperation Virtual Study Tour Final Report. Unpublished. This case study is from a series of virtual study tours created by The Institute for Transportation and Development Policy (ITDP) as part of a South-South Cooperation Project that facilitates the sharing of best practices in sustainable transport.